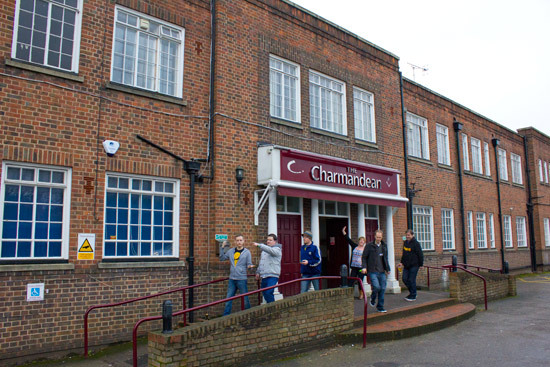 Location: The Charmandean, Forest Road, Worthing, West Sussex, BN14 9HS, UK. After last year's successful inaugural show, we were back at the Charmandean Centre in Worthing for the second South Coast Slam. Held over two days, the formula was changed slightly this time with the addition of video games to the mix, as well as a new classics tournament on the Sunday. 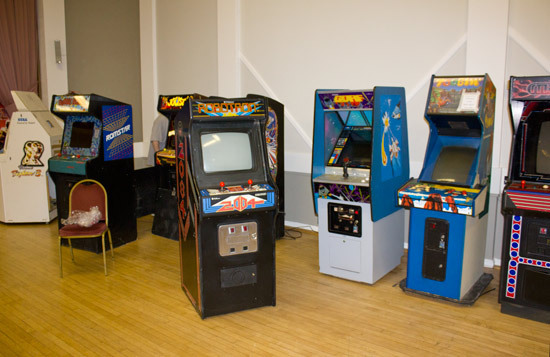 Before any thoughts of play could begin, the games had to be unloaded and set up in the main hall. Most of the games were set up on Friday evening with a few more not arriving until Saturday. 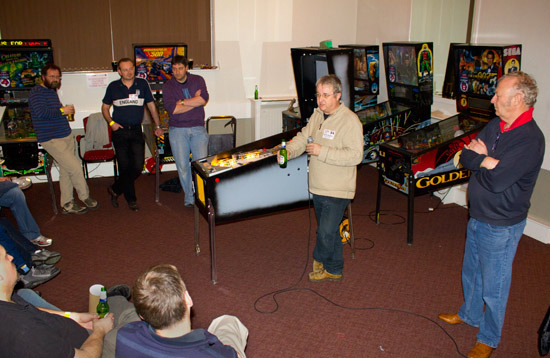 Despite the event being located on the south coast, pinballs came in from all over the country and even overseas. Ad Jonker brought two games from his personal collection in The Netherlands - Hoops & Bow and Arrow - while Andrew Heighway brought a bunch of games from Ireland. 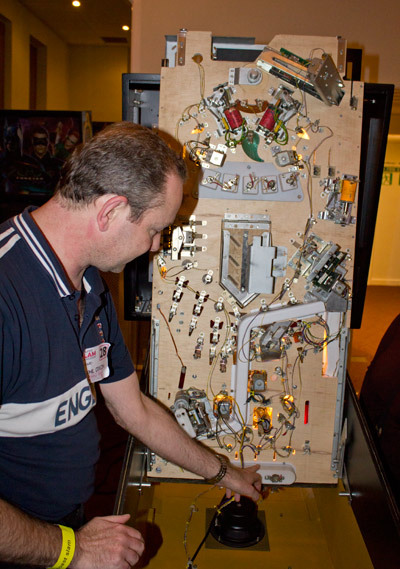 Most of the video games were brought by Dominic 'Rav' Escott who is a well known face on the UK video game circuit, but others came in from pinball and video collectors across the south of the country. 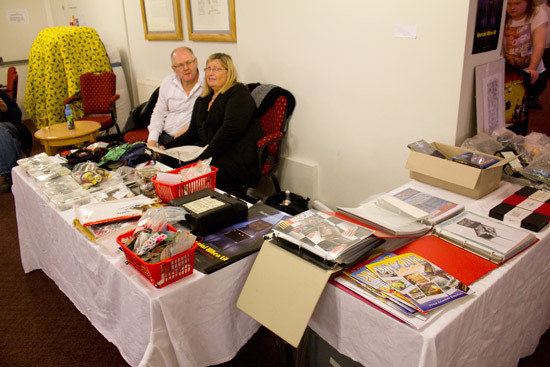 Show organiser Will Barber called an end to the set-up period at around 8:30pm on Friday when the hall was closed and everyone departed for a meal at a local Chinese restaurant. The hall re-opened at 8am on Saturday so last minute preparations could be made before the public opening at 10am. There were several interesting or unusual games on the show floor. Stern's latest model The Rolling Stones was set up for the public to play for what must have been the first time anywhere. 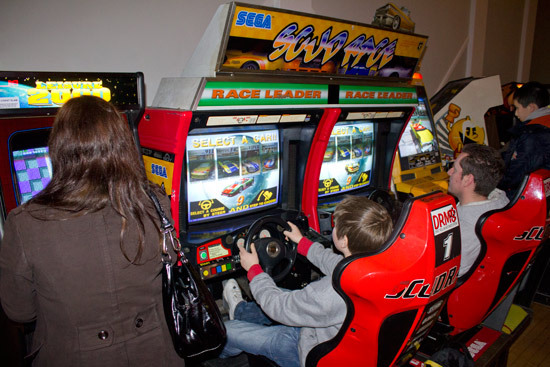 It formed part of the modern Stern line-up of 9 machines which included Avatar and Big Buck Hunter Pro. All three were generously provided by Stern's UK distributor, Electrocoin. 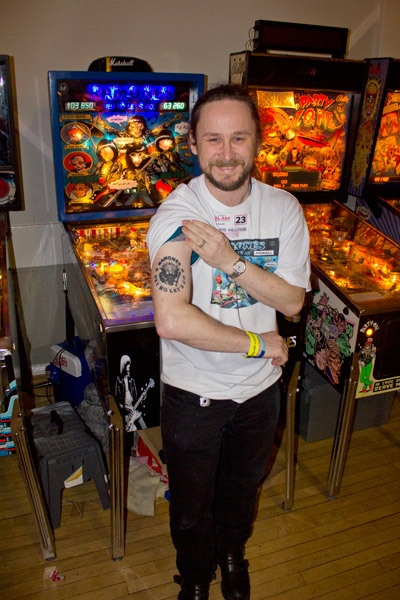 If you like music-based pinballs, Chris Williams' Ramones pin is certainly one not to miss, and with Ramones music blasting out from it all weekend, it would have been hard to miss. 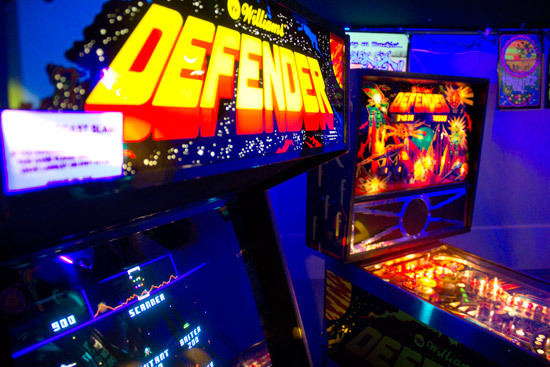 Chris will be explaining how he made the game in an upcoming Pinball News article, but for this weekend the game was available for the public to play. 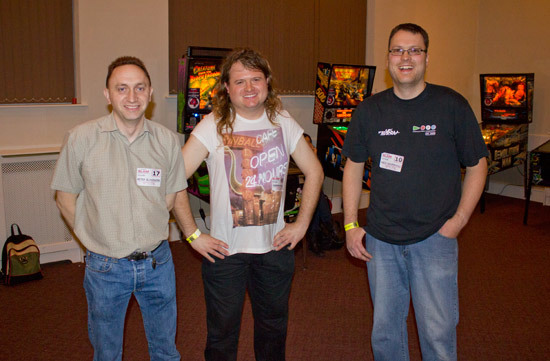 Also at the South Coast Slam were the team behind the Forbidden Planet pinball who were showing the progress on the project so far. They held a seminar on Saturday evening to talk about the game and we'll have more details about that a little later in this report. 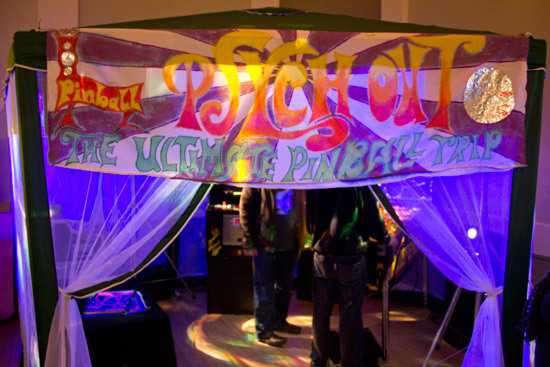 In all there were 82 pinballs and 29 video games available for public play. 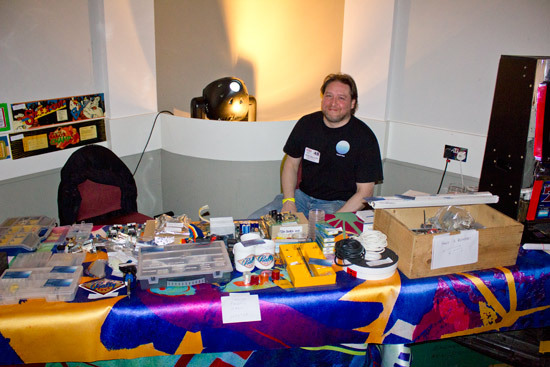 Apart from the games, there were five vendors selling assorted parts, accessories, pinball-related media or just promoting their business. 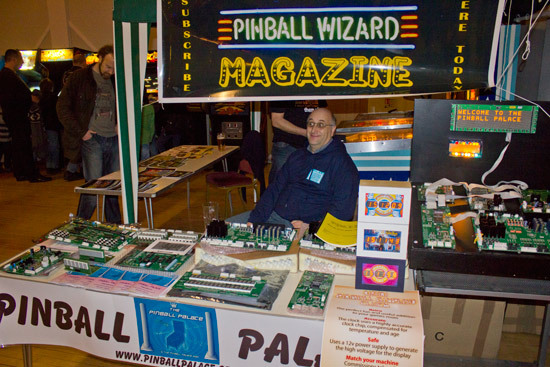 In the back corner of the main hall, Dave Willcox's stand had a wide variety of common and not-so-common pinball parts as well as a a 'rummage box'. Nearer the entrance, The Pinball Parlour museum in Ramsgate were spreading the word and had three electro-mechanical machines on their stand; Sing Along, Flip Flop and Subway. 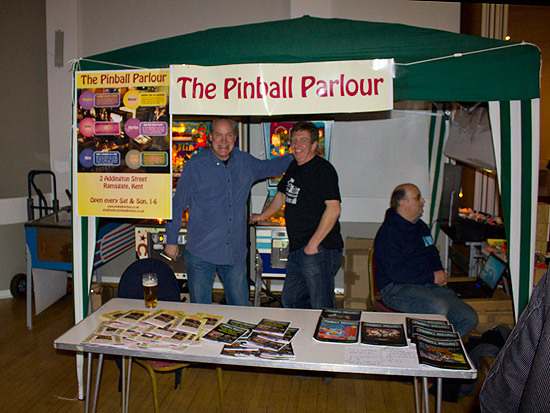 Sharing their stand was Sean Mills from Pinball Palace and Pinball Wizard magazine. 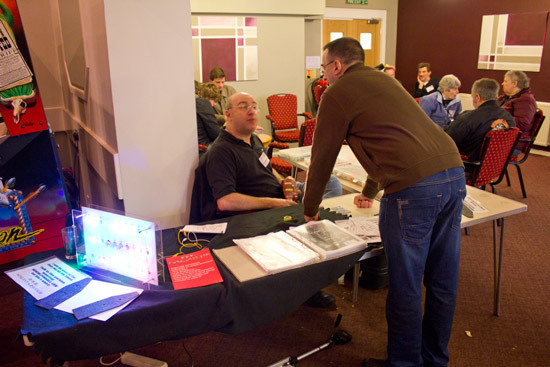 Sean was displaying his range of PinLED and Rottendog boards as well as digital clocks which use old Bally 6-digit displays to show the time. 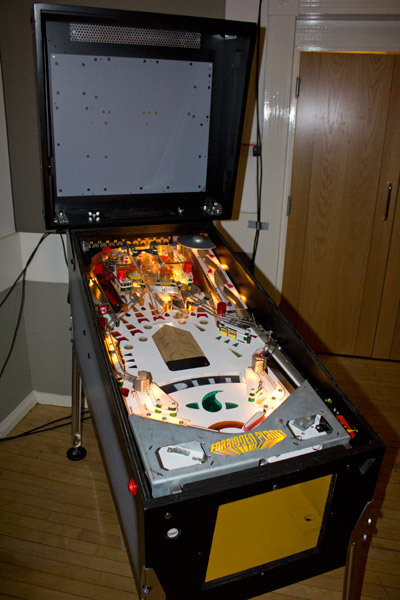 On a table to the left of the entrance to the bar area, Albert Medaillon was selling his range of pinball LEDs, some of which he kindly donated to the charity raffle. Opposite Albert, Gary Flower was selling flyers, magazines, posters, plastics and DVDs amongst his range of assorted pinball items. There were several competitions held over the show's two days. Two Cactus Canyon machines were set up in the tournament area and a high score competition was run on them both. Between them, a High Speed 2 - The Getaway acted as the kids high score machine. Games cost £1 for the Cactus Canyons and 50p for the Getaway with trophies for the top two scorers on all 3 games. 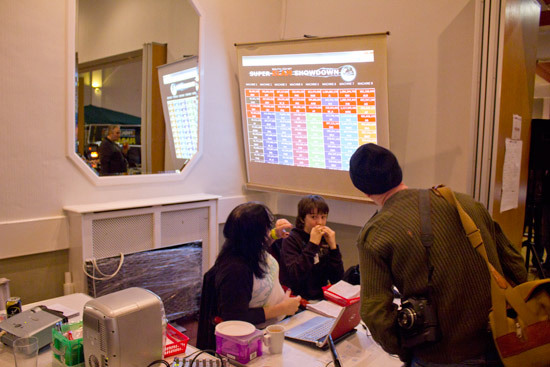 The first tournament to be held started when the doors opened at 10am on Saturday. 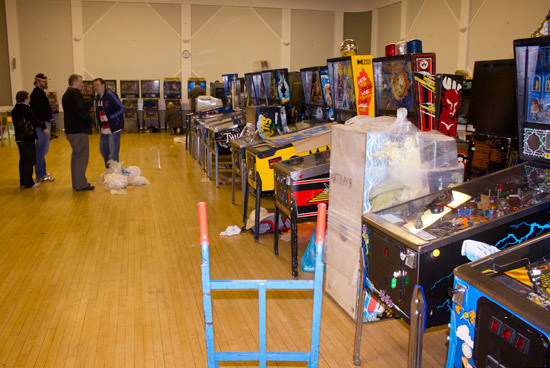 The Super Slam Showdown used 8 machines from which competitors chose 5 on which they played a single 3-ball game. The top 3 scorers on each machine moved on to the next round of play-offs, but players could only qualify once. That allowed lower placed players to qualify on 3 of the machines if a higher placed player had already qualified on a different machine. 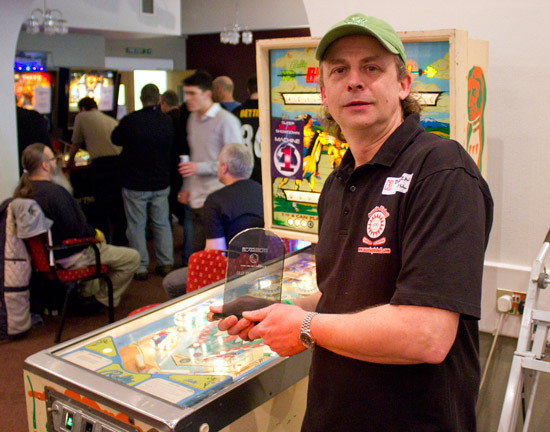 Entry to the Pinball News-run Super Slam Showdown cost £10 and pre-registration for the planned 48 places was required through the show website. However, demand far exceeded the initial allocation of 48 places, so 73 players were allowed to pre-register during the advertised window and another 8 were put on a waiting list at the show. In the end, everyone on the waiting list got their chance to join in for a total of 81 competitors. Qualifying ran from 10am until 4pm, when the 24 qualifiers were announced and shown on the projector screen. 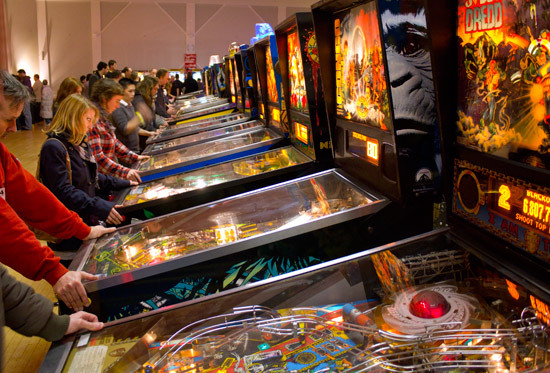 The 8 machines used were: Indiana Jones (Stern), Twilight Zone, Fish Tales, Creature from the Black Lagoon, Indianapolis 500, Demolition Man, Batman Forever and Goldeneye. 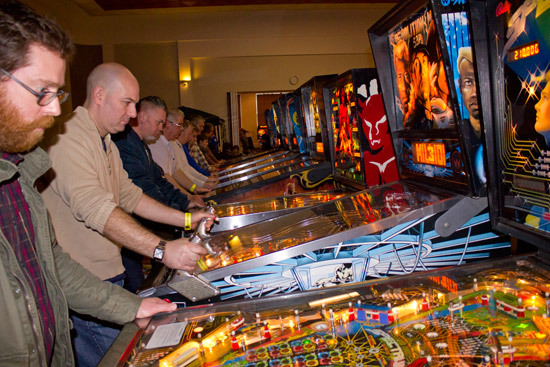 The play-offs consisted of 12 head-to-head best-of-three games, where each competitor chose a machine to play. 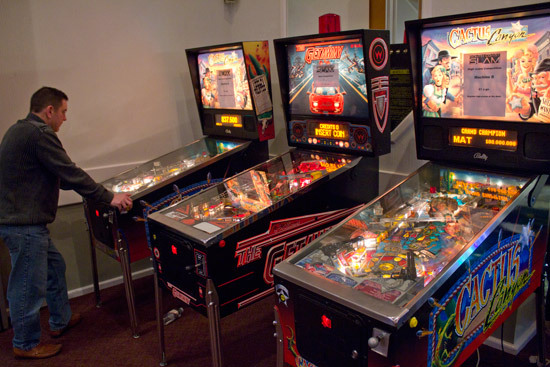 If the score was 1-1 after 2 games, a third machine was chosen for them on which to play the decider. The first round of play-off reduced the 24 qualifiers to 12. The next round reduced them to 6 and the penultimate round produced the 3 finalists. 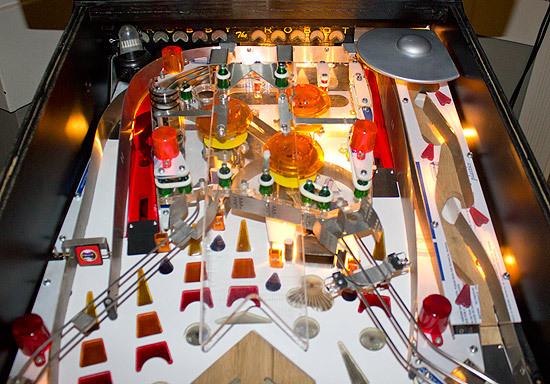 In the final, each player could choose one machine to play and points were award: 5 points for a win, 2 points for second and 0 points for third. Andrew chose first and selected Indiana Jones which he won, with Peter second and Nick third. Next, Peter chose Batman Forever but it was Nick who won on that game with Peter second and Andrew third. So, going into the final game, Nick and Andrew had 5 points and Peter 4 points. Whoever won the 3rd game would win the tournament. Nick chose Indianapolis 500 but it was Peter who took first place, the 5 points and the tournament win. Nick was second and Andrew third. 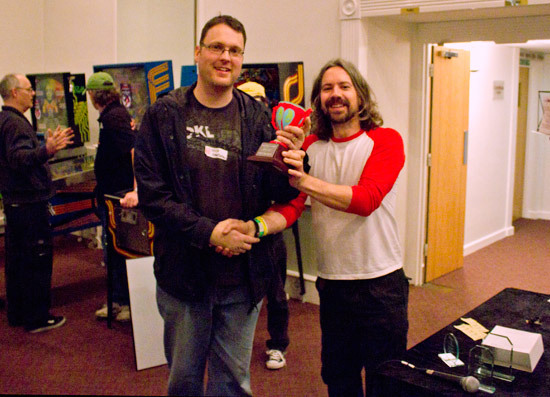 After the final, South Coast Slam organiser Will Barber presented the trophies. 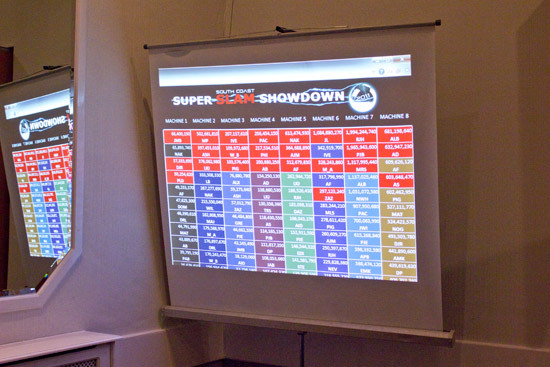 Here are the full results for all players in the Super Slam Showdown 2011. Running alongside the Super Slam Showdown was a video tournament run by Phillip & Adeline Eaton and Sal Langley. 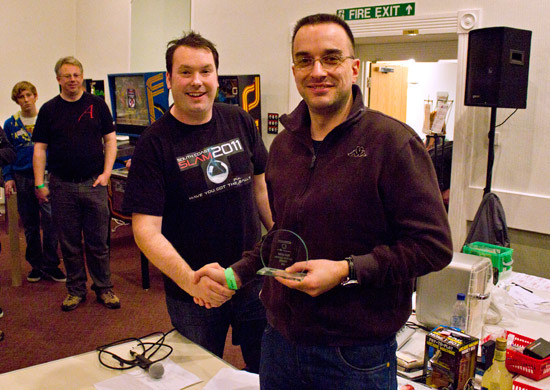 Six games were used for the tournament; Time Pilot, Pacmania, Asteroids, Gyruss, Tutankham and Stargate, and entry cost just £2. Players played all six games and points were awarded depending on the player's position in the rankings. The player with the most ranking points would be the winner. That winner was Greg Mott who was presented with his trophy on Sunday afternoon by Phillip Eaton. 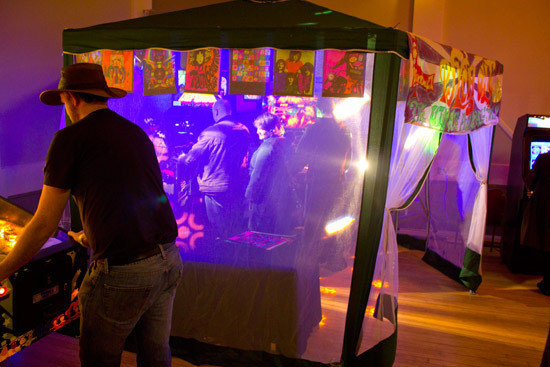 In the far corner of the hall, Ivan Durneen's Psych-Out tent was transporting visitors to another dimension on a trip overloaded with crazy sights and sounds courtesy of Dawn Raison. 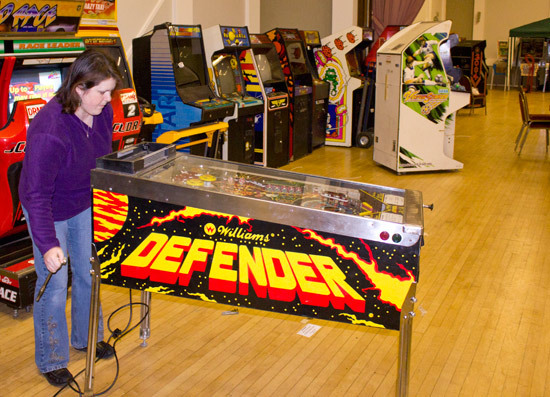 It wasn't just pinball though, as a duo of Defender machine awaited. Players were blasted with high intensity lights and sounds, while the compulsory distorting glasses added to the craziness. The best form of attack? The Psych Out competition lasted all weekend and the winner would be announced on Sunday afternoon. 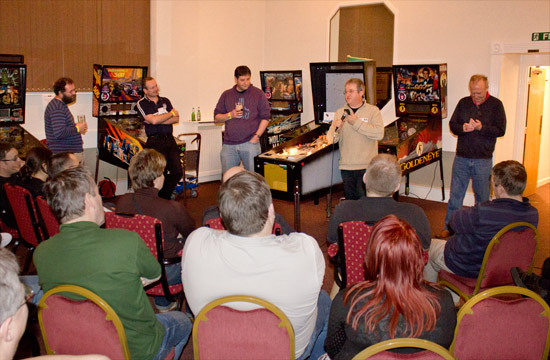 Straight after the Super Slam Showdown tournament, members of the team creating the Forbidden Planet pinball made a presentation describing the work and progress achieved so far. The game had been out on the show floor and this was a chance for those behind it to explain which stage the project had reached, how it had been achieved and how it is expected to develop. The final member of the team couldn't be at the presentation, but the game's designer John Trudeau joined the other members by telephone to talk about his involvement and answer questions from the audience. The game was mechanically well advanced but lacked a control system or artwork, although both these are currently in development. The show hall stayed open for those bringing games or helping out with the organisation until around 22:30 when Will brought the show's first day to a close. 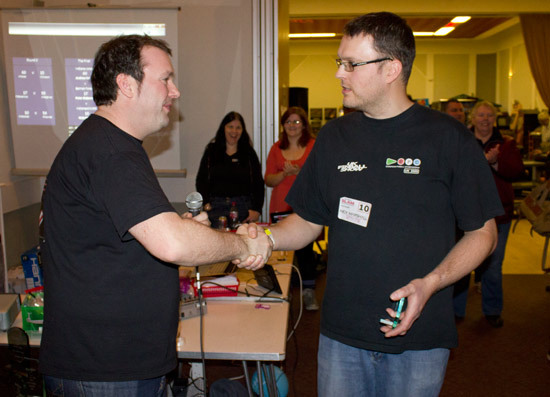 It re-opened at 10am on Sunday when the first Old Skool Rulz classics tournament began. Run by Nick Marshall and Kate Morris along the same lines as the previous day's Super Slam Showdown, players had 8 machines from which to choose any 4 and play a single game on each of them. 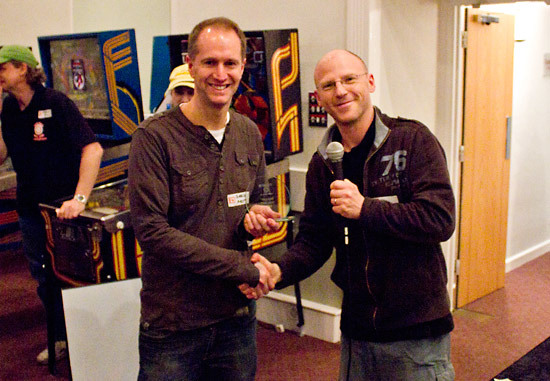 Up to 2 entries were allowed per player at £5 each. Players could play any of the same games in the second entry, or choose different ones. When qualifying closed at 1pm, the top 2 scorers on each game would qualify for the play-offs. The machines used were; Bow and Arrow, Aladdin's Castle, Escape from the Lost World, Gorgar, Lost World, Spectrum, Starlight and Blackout. The 16 qualifiers were then split into 4 groups of 4 who played a single 4-player game on either Blackout, Spectrum, Starlight or Lost Word, with the top 2 proceeding to the semi-finals. Those 8 were split into 2 more groups of 4 to play a 4-player game and decide the 4 finalist. The last 4 were Nick Marshall, Darren Ball, Peter Blakemore and Dave Langley, but it was Darren who triumphed in the final and won the Old Skool Rulz tournament on Bow and Arrow. While the Old Skool Rulz tournament was taking place, the first meeting of 2011 for the London & South East region organised by Dawn Raison was taking place in the bar area. 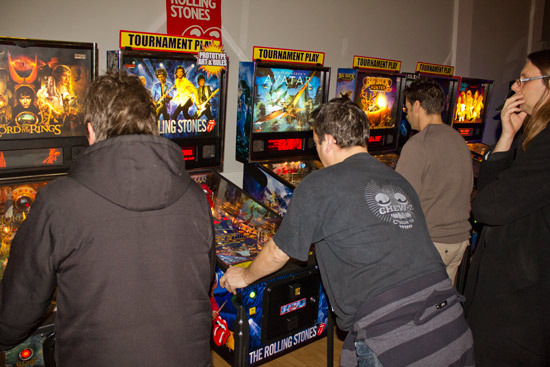 They were playing on four machines - Creature from the Black Lagoon, Fish Tales, The Lord of the Rings and Demolition Man. A mammoth 255M score on The Lord of the Rings helped Martin Ayub win this first round of the League, with Mike Kindler second and Stan Simpson third. As the day progressed, the Psych Out and high score competitions also drew to a close. For the second year running, Nick Marshall won the Psych Out trophy on the Defender game. The kids high score competition on The Getaway was won by William Moore with a score of 125,663,370. He had already left when the prize giving ceremony was held. Second place went to Harry Rolfe who was close behind on 120,933,260 points. The two Cactus Canyon games were treated as separate high score competitions which made sense as the scores on the two differed quite severely, with the high score on one being almost twice that on the other. While the winning scores differed, the player achieving them was the same. Peter Scheldt got the top scores on both Cactus Canyons - 59,878,000 on the first and 99,593,220 on the second. 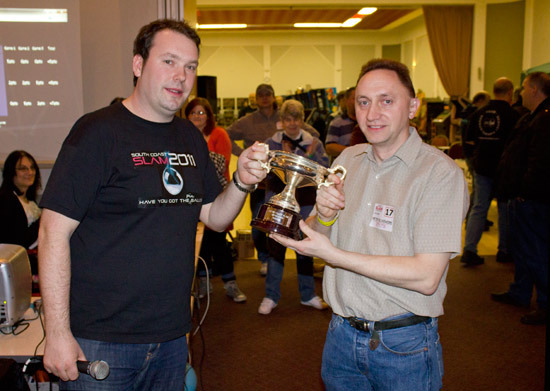 Michel Dailly was in second place on the first machine and Aid Cooper was the runner-up on the second machine on 49,222,960 and 82,455,440 respectively. Sitting by the entry desk for the whole weekend was the grand prize in the charity raffle and on Sunday afternoon it was time to award it - along with all the other donated prizes - to the lucky winner. 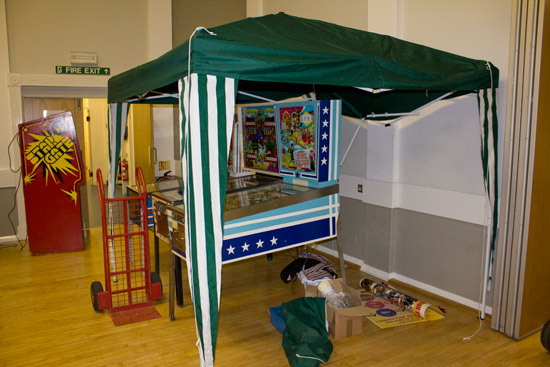 Last year the prize was a Popeye game, but this year the organisers had gone one better and acquired a Whitewater pinball as the main prize. Not only that, there was also a laptop computer, a pachinko machines (complete with balls), an Avatar translite signed by Gary Stern, an Iron Man translite, along with a wide range of DVDs, t-shirts, toys, electronics, drinks and much more to win. Tickets cost £10 ($16) for 5, or £20 for 15 and could be bought at the entry desk or on-line. 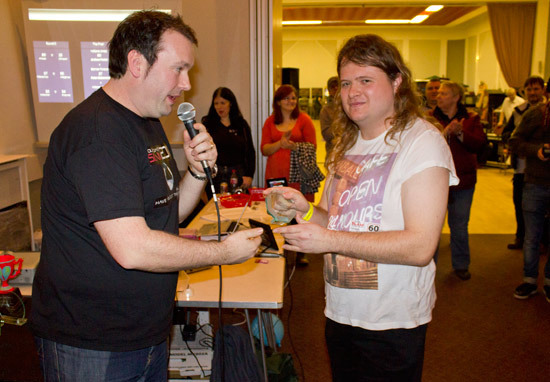 The Whitewater was drawn first and Andrew Stockdale was the lucky winner. He wasn't at the show and had bought his raffle tickets by e-mail. The remaining prizes were then drawn with the winners getting to draw the next winning ticket. 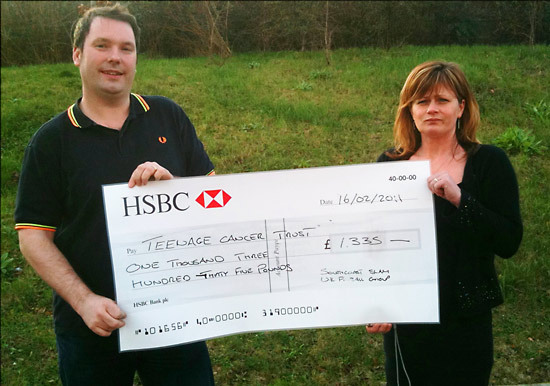 Once all the ticket sales had been counted and added to the show entry fees and tournament entries, a grand total of £1,335 ($2,136) had been raised for the show's selected charity, the Teenage Cancer Trust. 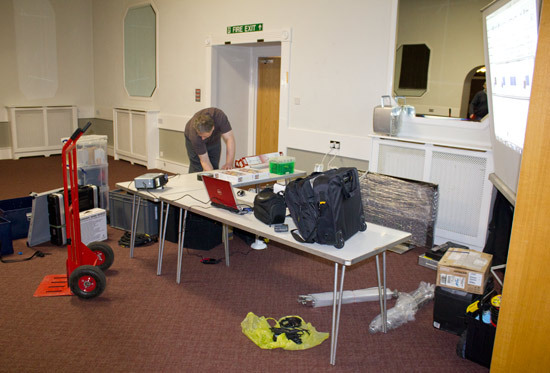 With all the formalities completed, it was time to start packing everything away and preparing for the journey home. 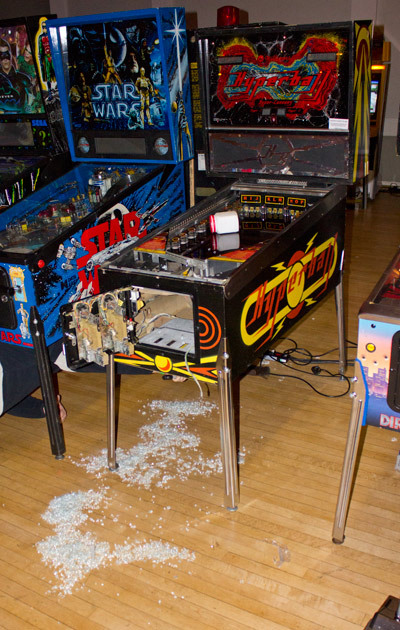 Unfortunately, there was one casualty as Dave Langley's Hyperball suffered an exploding glass incident, resulting in thousands of tiny pieces all over the floor and inside the game. 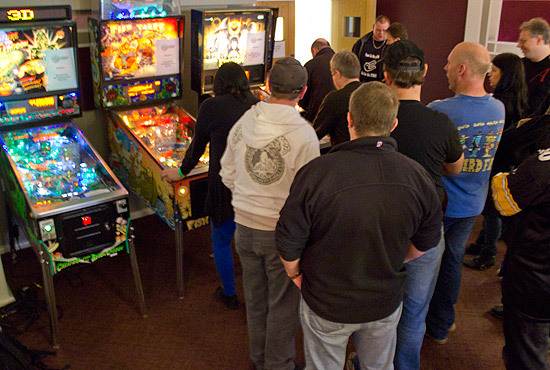 It had also been hoped to stage a special screening of the recently-released Special When Lit pinball movie, and a large plasma screen along with a Blu-Ray player were standing by, but with the Super Slam Showdown overrunning, there was a lack of time to give the movie screening the prominence it deserved. Nevertheless, this year's South Coast Slam was widely considered a huge success and even better than last year's. 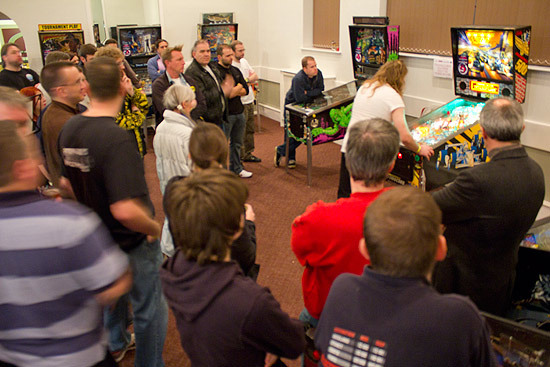 The addition of video games introduced the video crowd to the social side of the pinball collector community, showed them the type of pinball shows currently being held in the UK and will hopefully lead to more crossover events such as the R3play event held in Blackpool last year, and scheduled to return in November 2011. 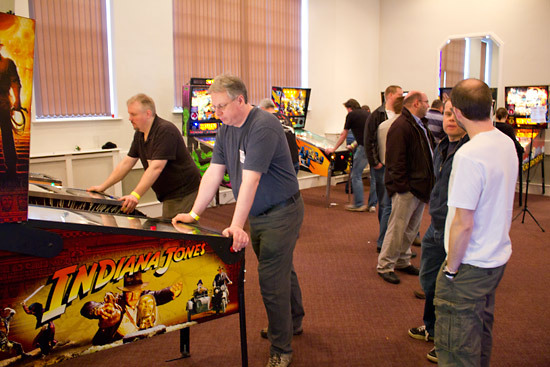 It was certainly a packed weekend for all those running the show, or playing in, helping in, or organising the tournaments, and the wide selection of games on the show floor meant visitors were never short of something different or unusual to entertain them. The only remaining questions are; where did all the time go, and when's the next Slam?